A track in the grounds of the Forest Town Institute (later called the Forest Town Welfare) was opened in 1908 at the same time as the Institute building. 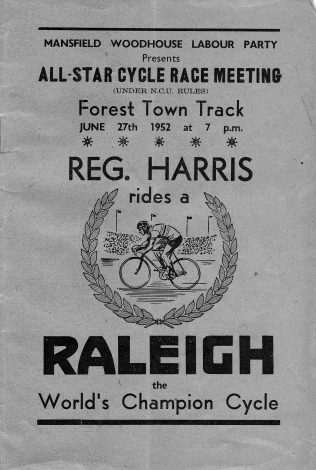 While the track was used for running, cycling, and parades it is the cycling events that people recall most of all. 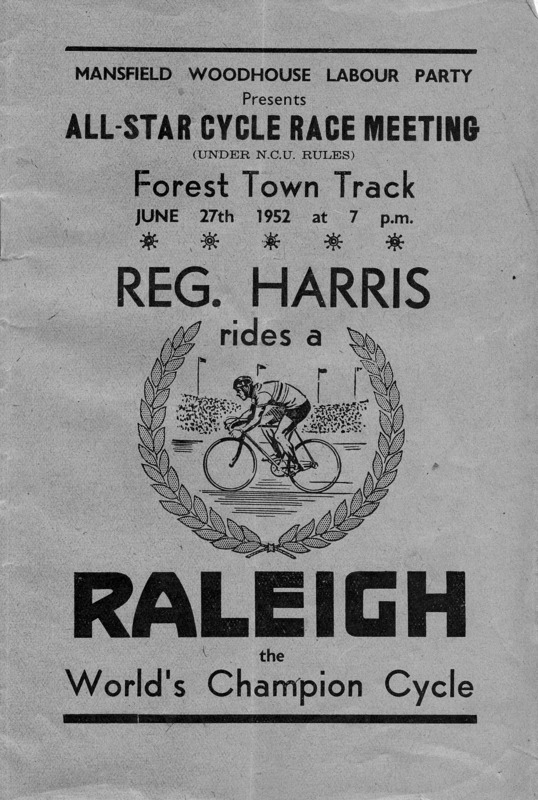 In years gone by as many as 2,000 spectators are said to have been at Forest Town for the cycling. 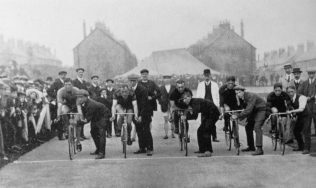 Names of local racing cyclists from the very early years are recalled as, Freddy Ghilks from Mansfield Woodhouse, the Murphy Bros, Harold Mapletoft, Jack Torry, Percy Wylde, Bunny Brailsford, and John Newton. 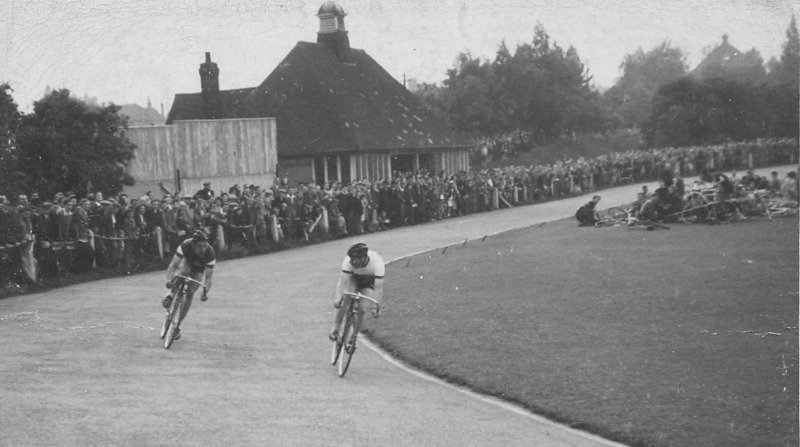 Additionally well known cyclists such as Enzio Sachi (Italian), Arie Van Vliet (Dutch), Sid Patterson (Australian), and Reg Harris (English), are known to have been at Forest Town. It seems the spills and thrills of the track events were something to be enjoyed by some lads from the village. They used to go to the bottom left hand corner of the track near Fourth Avenue , because if an accident was going to occur they said it would happened near that corner! Ask any ‘Forestonians’ about the cycling events and they will say ‘and what about the ginger nut man? This man is described as being a little plump man with a moustache, who carried a large baker’s basket full of ginger nuts to sell, sometimes he was generous and gave the kids some. While everyone remembers him, no one knows who he was. 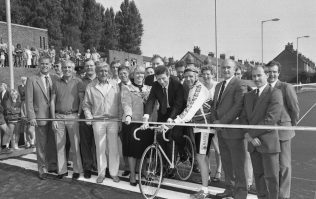 A report in the Chad newspaper in November 1987 revealed that the Forest Town Cycle Track which had fallen into disuse and disrepair could be on its way back to former glory. Work had started on a £42,000 [sic]improvement scheme to restore the track to the standards of the British Cycling Federation. 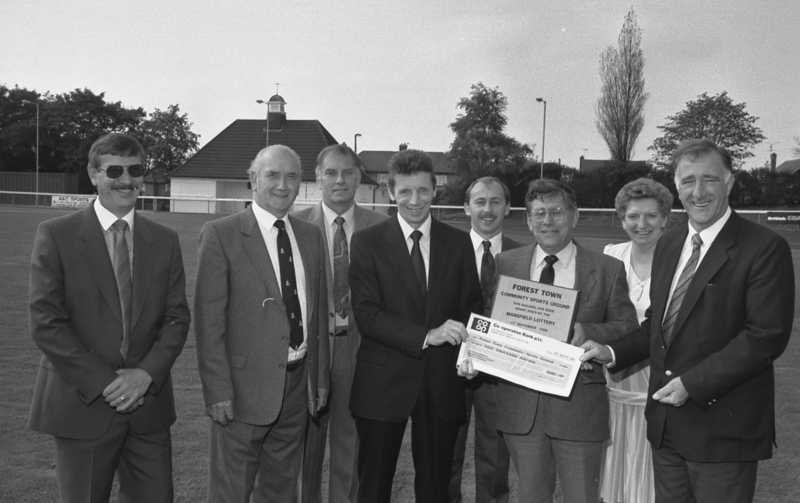 Newspaper headlines (Chad) on 22nd September 1988 read ‘New Sporting Chapter opens at Forest Town’. The article continued ‘Forest Town’s showpiece complex was officially unveiled on Saturday when two days of Gala celebrations got underway. 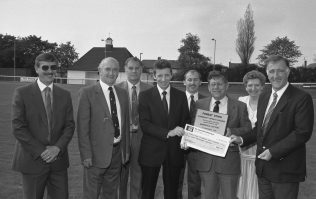 The £30,000 [sic]venue at Pump Hollow Lane boasts an international standard cycling track, a football pitch, bowling greens and a cricket square.’ Part of the weekends celebrations was a cycling display by Mansfield Aces Cycling Club, who planned to use the facilities on a regular basis. 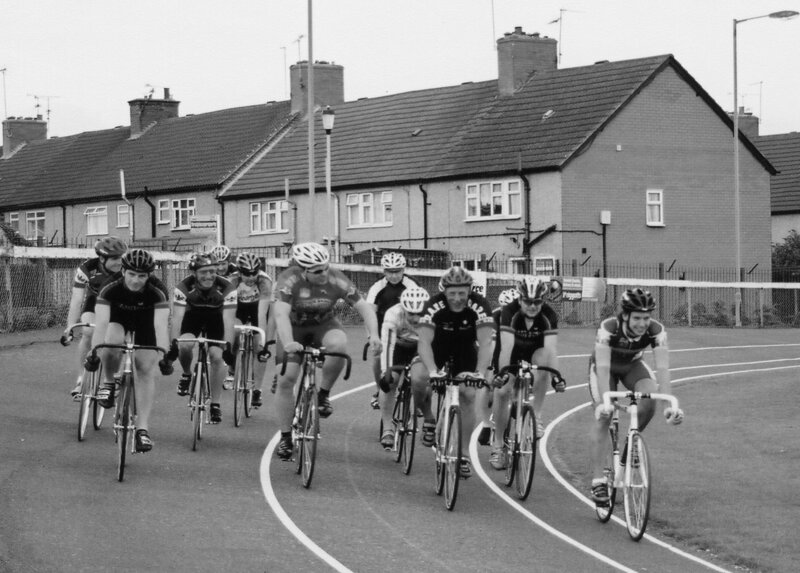 It is understood that Mansfield Aces ran the Cycling Track League events at Forest Town for a number of years, and they were still holding events there in 1991. In 2004 the Forest Town Track was once again in demand after a track training facilities at Harvey Hadden Nottingham were lost, (Nottingham City Council had dug the track up to provide more athletic training lanes). Once again with the help of Mansfield District Council, Forest Town Welfare, and D.A.R.E. the track at Forest Town was resurfaced, and fenced to allow it to be used for training, and the track league. All the activities from Nottingham were transferred to Forest Town, and regular Wednesday night events were held. Around 2006 (maybe before) the Track league events had been organised and run on a Wednesday night by Stan (Stash) Kalisz, The aim of the League was to encourage children and seniors to ride in a safe environment, additionally to hold events for seniors and veterans. Stan who was well liked and respected especially by the youngsters sadly died in 2008. 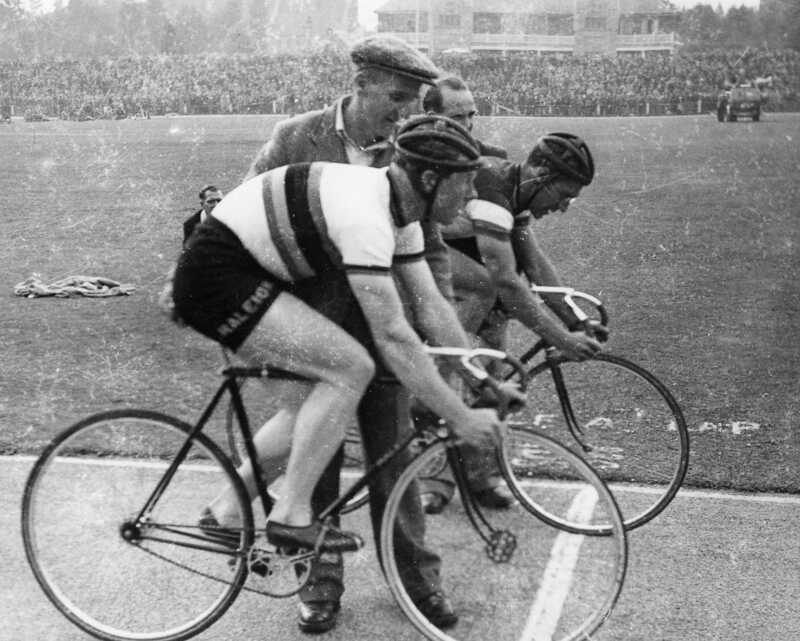 In Stash’s memory it was planned that the Track League would continue during that year. It was fitting that cycling still took place on the Forest Town track in 2008, as this was 100 years after it first opened in 1908. So nice to see that the track is still up and running. My dad, Roy Hunt was a member of the club and was a keen track rider for the Aces in the 50s. If anyone knew my dad or has photos from that era (or the early 80s when my dad got involved with the Aces again) then please leave a message or get in touch via this web page. The track league is still running and going from strength to strength, we are now sponsored by Sherwood Pines cycles, and run under British Cycling rules, we are hoping to run regular training nights next season and are hoping to run Go Ride events for younger riders as well. 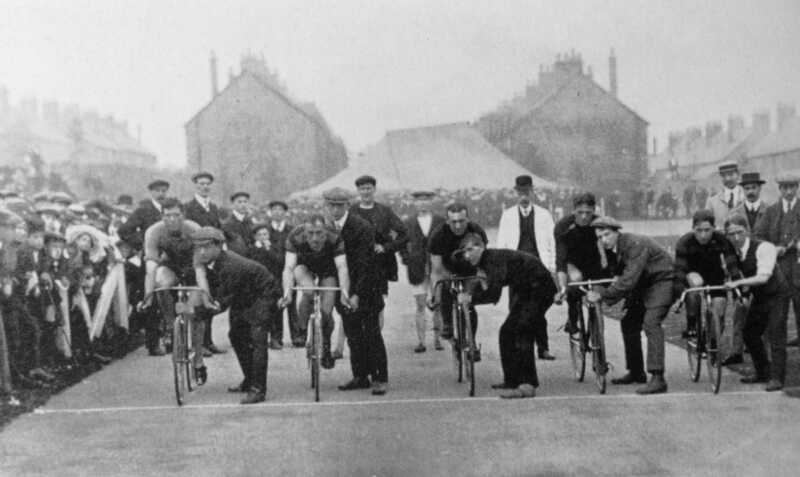 You have not mentioned the notorious `Mansfield Aces` who were out to beat anyone on a bike, most of them quite good. Brian Rowley ( Canadian ) John Blood, Gordon McKinnon, Squib Harper( A & C Sports ) and a few more who actually raced against the likes of Reg Harris. I have a picture of my dad racing Reg Harris on a track. They were also quite good at Barrel Jumping at the old Nottingham Ice Rinc. It is good to learn you used to enjoy the training nights at Forest Town track. Hopefully you will find the answers about present day training events on the web site http://www.foresttowntrack.co.uk listed on the above page – happy cycling. i was going to the wednesday training nights a few years ago ,is it still running? and how much is it ? many thanks clive edmunds ,sheffield.